One of my favorite expressions when it comes to a discussion of great design is “less is more” – a phrase that has come to be widely associated with Mies van der Rohe, whose focus on simplicity of style is reflected in his architectural and furniture designs. In short, simplicity and brevity can be as or more effective in design development than elaborate and complex design systems. 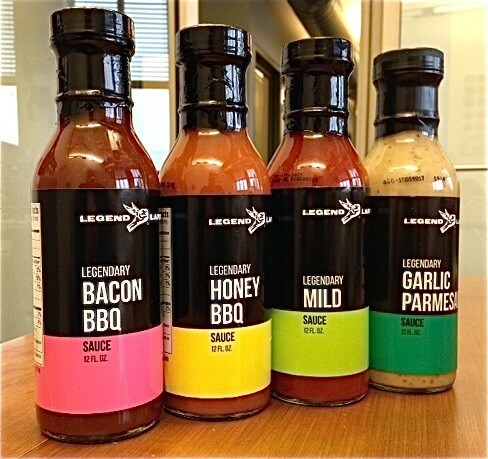 To me, this principle does not imply a design must be quiet, recessive or shy to succeed – but does strongly apply to the packaging designs for Legend Larry’s® sauces. 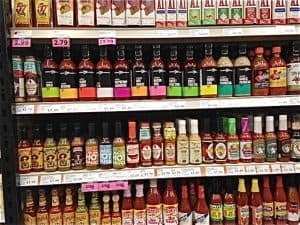 In a category with substantial competition from well-established brands, Larry’s sauces couldn’t help but steal the show on shelf. Packaging in this category is an assortment of sizes and shaped glass bottles with labels denoting flavor varieties and levels of heat. Color palettes tend to be intense yellows and reds, and rather lavishly decorated as they reflect verbal and visual messages about heat. By comparison, Larry’s packaging stands out because of its clean, spare, essential design approach on uniformly sized bottles. The design is comprised of two color bands, one to highlight the flavor, a second to house net content. The copy on the side labels is limited to legally required communication only, resulting in Larry’s labels being devoid of decorative elements, positioning statements and appetite appeal images. Within the black portion of the label, a consistently positioned and sized logo leads communication but is secondary to the single important word or words describing flavor or heat level. 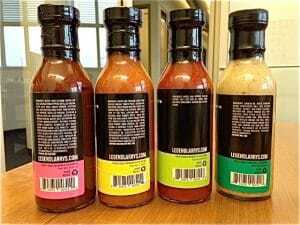 A secondary bold, bright color band that suggestively relates to the flavor intensity of the sauce, encourages the eye to track directly and easily pulls your view across the full product line. The benefit of this spare approach is it leaves it wide open for consumers to visualize how any one of the sauces can be used in multiple applications – like wings, ribs, and condiments. I would love to say so much more but the simplicity of the label says everything. If there was one thing I would change it’s the logo – but only to the extent that it needs refinement. I believe the image in the logo is a flying pig but I am assuming a great deal. It needs clarification or definition so the image is immediately recognizable and impactful – as impactful as the package design itself. Why? Because I cannot say it enough – the battle for recognition on shelf is extreme. If your package does not cut through the noise surrounding it, it has no chance of edging out the competition. I say well-done Larry’s. I bought several bottles of sauce and I am already thinking of ways to explore using them. One last comment – the packaging is as impactful in my cupboard as it is on shelf. Even those in the household that can’t find the peanut butter to save their life, easily spotted this package and asked where I picked it up. This package is such a great example of simplicity being bold and impactful – with so much less being so much more effective. I can’t wait to see what is next for Larry’s. If you are exploring innovative packaging, contact us at 920-886-7727 or info@brand-directions.com Throughout our 60 plus years of supporting customers with consumer brands large and small, we apply our experience and expertise to the entire process to create efficient and effective solutions.